A place of prayer for centuries, the church stands on the ancient site of a monk’s cell. His allegiance was not to the grand Abbey at Tintern but to the Priory of St. Mary in Chepstow. The location, deep in a valley beside a stream, has an atmosphere of solitude and peace. Erected in the 1880s for a small rural community under patronage, it now caters for an expanding population on the outer environs of Chepstow. The Sanctuary furnishings are mainly a memorial to Capt. Ian Oswald Lidell, VC., 5th Battalion Coldstream Guards, killed in action in 1945 aged 25. Stained glass windows are memorials to the Evill and Bragington families. The gravestone of Christopher Cooper ‘who departed this life April 8th 1680’ indicates that the churchyard predates the present building by some considerable time. The dedication is open to debate. Andoenus is identified by some as an obscure Greek saint and by others as Owen. Initially a scribe in 7th Century France, he became Bishop of Rouen and Chancellor to three French monarchs, one of them an Anglo-Saxon woman. 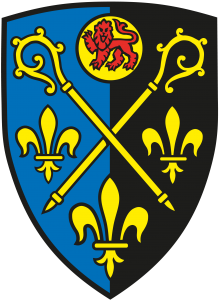 His ‘pursuer of pagans’ reputation is subsumed by his scholarship here; he is represented in the Grouped Parish Logo by the quill of the scribe.